Active Lives, Healthy Minds is a mental health and wellbeing project focusing on the Nepalese, Somali and Tamil communities in west London. 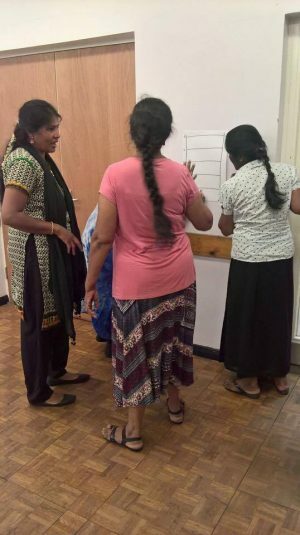 The project is run by Race on the Agenda (RotA) in partnership with the Tamil Community Centre, Ilays and Account Trust. The partner organisations specialise in the provision of services to Black, Asian, and minority ethnic (BAME) and refugee communities and deliver a wide range of services including immigration and asylum advice, welfare benefits advice, English language learning, and creating social opportunities to alleviate isolation. The project will assist community groups in developing activities to support their mental health and wellbeing in a culturally sensitive and non-stigmatising way. RotA have commissioned the McPin Foundation to develop an evaluation framework that will enable them to capture the outcomes of the project. Members of the Nepalese, Somali and Tamil communities have experienced severe loss and disruption of their lives due to war, civil unrest and natural disaster in their countries of origin, followed by the traumatic experience of flight and the stress of adapting to life in the UK. Many of the people supported by the project are not used to completing standardised forms normally used in evaluating community projects and do not relate to mental health language. It is important to develop evaluation tools that will ‘make sense’ to people taking part in the project and that can measure its impact in a meaningful way. We will develop an evaluation framework including suggested data collection tools that are appropriate to the context of the project and responsive to the needs and strengths of those taking part. We will train RotA and their partner organisations in implementing the evaluation framework and support them through the process of data collection over the coming two and a half years. In spring 2017 we began conducting a consultation with staff of the partner organisations who are facilitating project activities on the ground. This will inform our development of the evaluation framework. Update summer 2017: We completed a consultation with staff of the partner organisations who are facilitating project activities on the ground. This informed the development of a draft theory of change that is currently being tested. For more information about the project, or to speak to a researcher, please contact Andreja Mesaric by email: andrejamesaric@mcpin.org.